I shared with you last week that our first project of the year is a little kitchen makeover. Paint is going to be the biggest part of the transformation. Our kitchen has white cabinets, black granite and a sea salt green color on the walls. I have been itching to paint the walls white. I think it is going to work so much better with the black countertops. 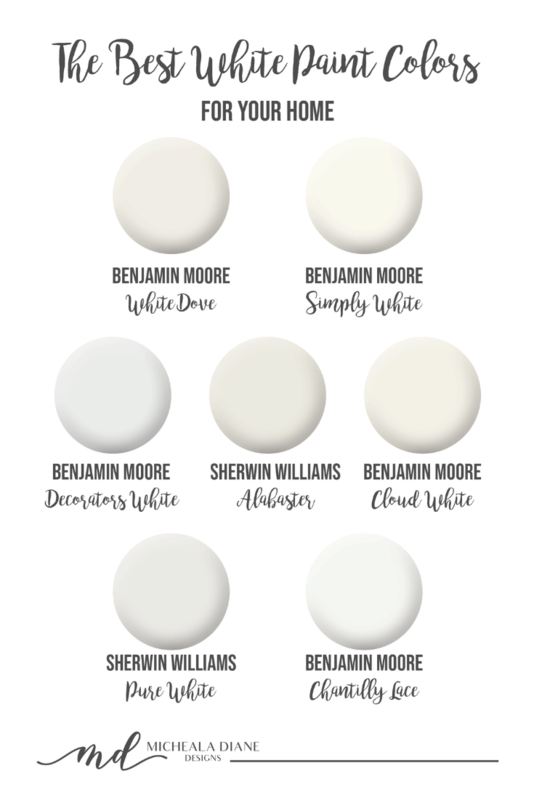 So today I am sharing my tried and true favorite white paint colors. 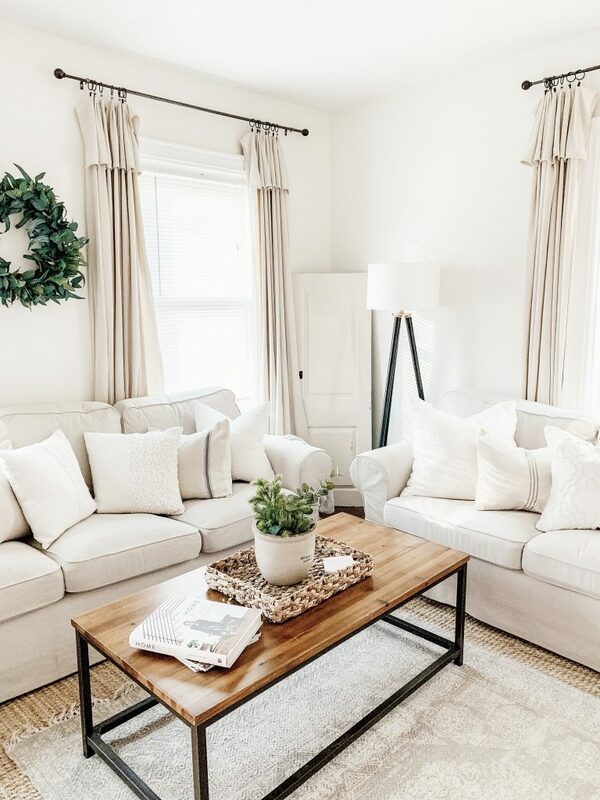 I have had the opportunity to pick paint colors for a large number of design projects and these whites are always my go to options. White Dove is a beautiful warm white. It has some grey undertones making it a soft creamy white but without looking yellow/off white. This is a great color for walls, trim and cabinets. 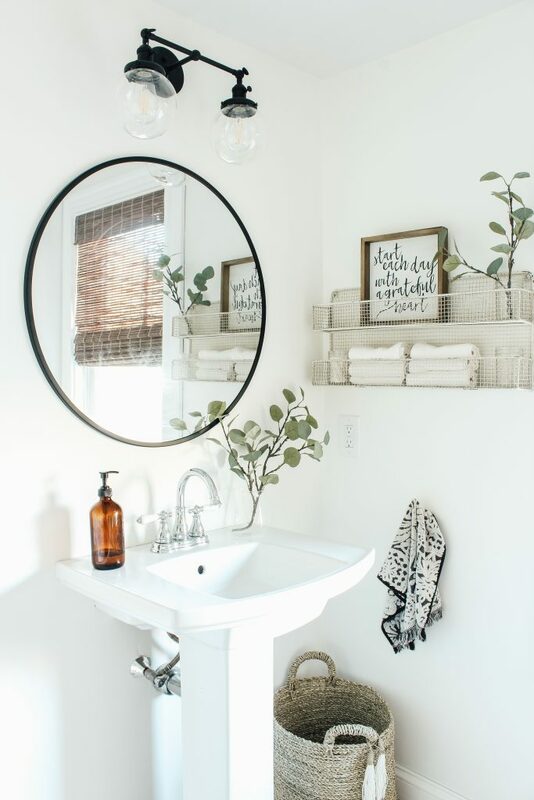 Simply White is the color that we painted our downstairs bathroom and I love it! It was named the color of the year in 2016 and I think it is one of the most versatile whites. This white paint is warm without being too yellow and crisp without being too blue/stark. It gives a fresh clean look and is fail proof if you are having a hard time deciding. Decorators White is a true white. 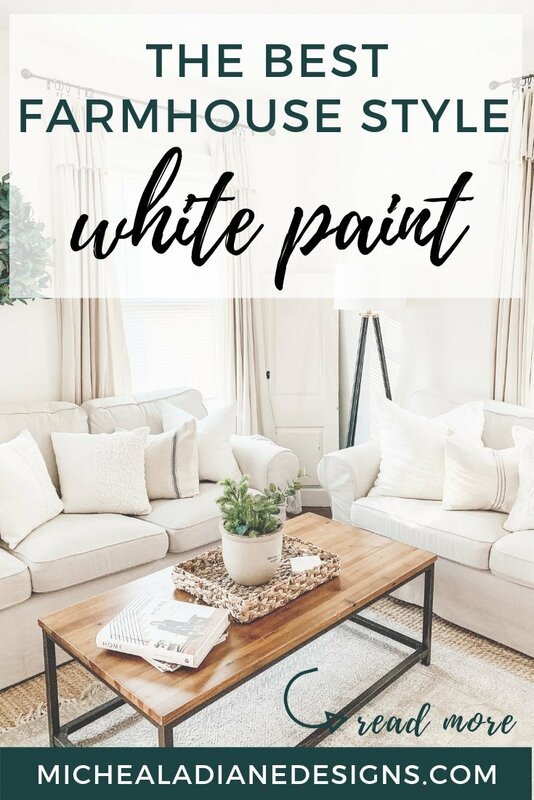 It does have a slight touch of grey that softens the color, but overall this is my go-to for a clean true white paint. I use this most often for trim or cabinets. We have Alabaster in our living room and it is a gorgeous cozy warm white. 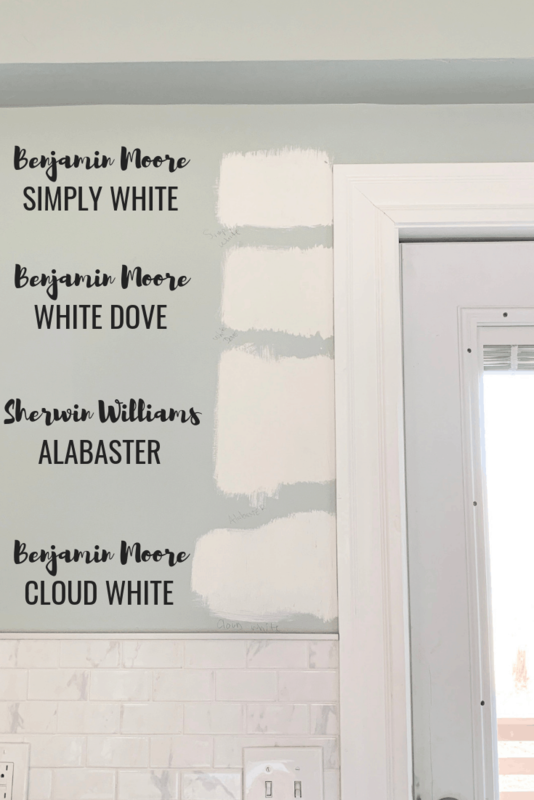 It is very similar to Benjamin Moore White Dove. It’s not too yellow and looks great next to bright white trim. This is also a popular color used for shiplap. Cloud White is a soft warm white and falls in the middle of White Dove and Simply White. It has neutral undertones that makes it very versatile. This color can be used for both walls, trim, and even your ceiling! Pure White is a crisp white with just a little bit of warmth making it perfect for when you are looking for a true white that isn’t blue/stark. 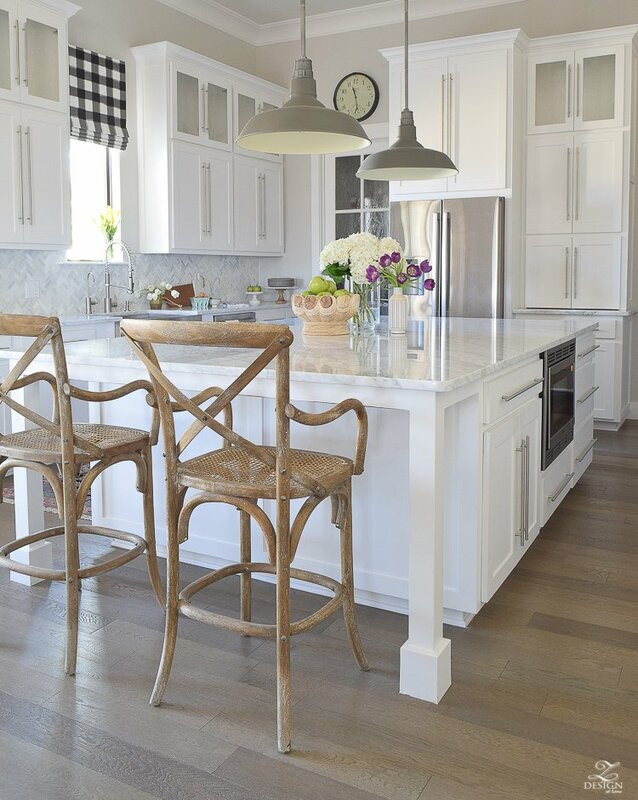 This color is perfect for cabinets if you are going for a white kitchen. It’s also great for walls and trim. Chantilly Lace is another true white that has a bit of a blue undertone, giving it a fresh clean look. 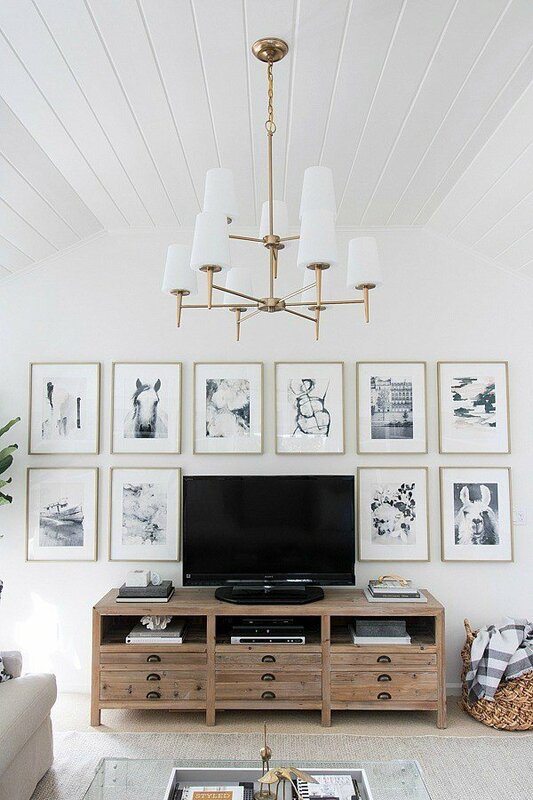 This is more of a stark white, so it pairs well in a room that uses cool tones in the overall decor. Now that I have shared my favorites the hard part is choosing one. Below are the tips I use for myself and my clients. Narrow down your options. I like to collect a bunch of colors and then narrow it down to 3-4 choices. More options than this will be too overwhelming and make it way harder to decide. The next step can be done one of two ways. 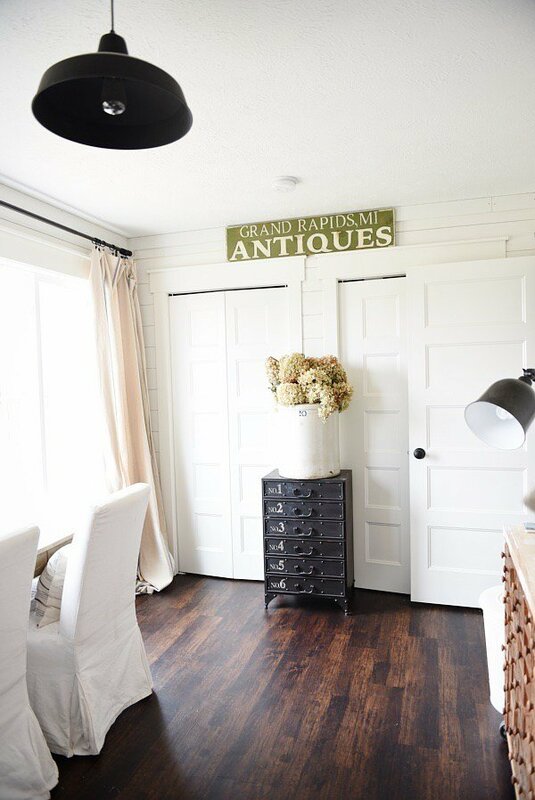 If you don’t mind paint samples on your walls you can paint the 3-4 colors you chose in a couple of different places within your space. Another option is to paint the samples on a large foam core board and move it around your space. The point of this is to see what the colors look at different times of the day and with different amounts of light. You will be surprised at how different a color can look at different times of day and in natural vs artificial light. Another important thing to keep in mind when choosing paint is the sheen. I typically do Eggshell for the walls, Satin or Semi-Gloss for trim and flat for a ceiling. The sheen can affect the way a color appears, so it is important to decide this before you select samples. For my kitchen project, I have narrowed it down to Simply White, Alabaster, Cloud White, White Dove. Let me know your favorite in the comments! Want to save this for later? 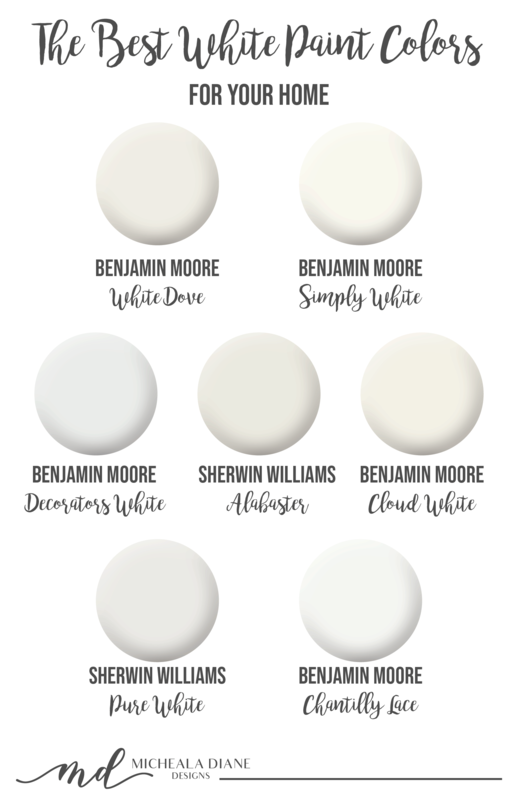 Post this Best White Paint Colors to your favorite Pinterest Board! Try Moonlight White Benjamin Moore #2143-60. Love your Whites. They look so comfy! Thanks Robin! Moonlight is another great color I have used it on a few projects! I like Alabaster. I am not a fan of gray in any form, it’s a cool color and I am by nature a warm color person. Alabaster is definitely on the warmer side, such a pretty color. Thank You for stopping by the blog! I love the look of white dove on the walls. What white would you pair with it if you were painting white on the cabinets? I would paint them both the same color if you want white walls and white cabinets. If you want them to be different I would have the cabinets be a true white like BM Decorators white. What do you think about SW Albaster White on walls but kitchen cabinets, trim, doors, and ceilings in SW Pure White? I’d like for them to have a hint of contrast. Do you think Albaster is creamy? Hi Kati, Alabaster is a creamy white. I do however love how it looks with my bright white trim so It could work with your kitchen cabinets. I would test a sample next to the cabinets because sometime a warmer white next to a cool white can look yellow depending on the amount of natural light in your home.